I know, I know, I didn’t post anything yesterday so this should be Day 5 but I wasn’t using the Vista machine yesterday, I was using the Mac for a Keynote presentation I was giving. Powerpoint has nothing on Keynote. Are you at the ‘I give in’ stage Tom. Usually around this time when things go pear shaped, you’d be giving it plentiful WTFs or something similar? I had the same problem with Vista and SecondLife when trying to run it for the Blog Awards however I got the drivers and installed them manually and that worked for me. I’m close Dennis – I’m back to using the Mac again, more and more! I’ve completely reverted to the Mac for email, for example. Conor – excellent, thanks for that. Is it that bad, I’ll stick with XP then. Did you check that the switch is on “speed” and not on “stamina” mode (next to the WLan switch & power button). 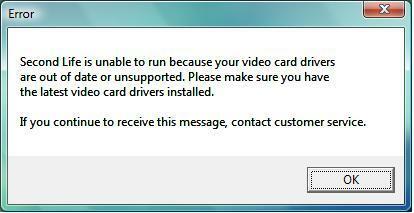 Because when on “stamina”, the VAIO uses the built in intel VGA card from the chipset. When on “speed” mode, it uses the external VGA card. 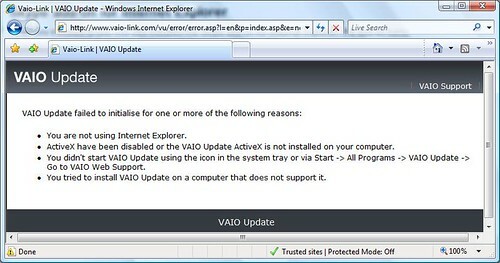 Regarding drivers, instead of using VAIO Update (which probably doesn’t work because you are not using the original SONY build), you can have a look on http://www.vaio-link.com for manual download. I have 1.14.0.1 – may be worth a shot?